I'm very cute and cuddly! I'm made from a new pair of cream and burgundy childrens socks with a flower pattern. I have a burgundy face, eartips and toes and a frilly edge to my flowery jumper. My eyes, nose and mouth are all hand sewn with cream yarn so I don't have any sticky out dangerous bits. I measure 22cm from ear tips to bottom and I'm stuffed with polyfil. 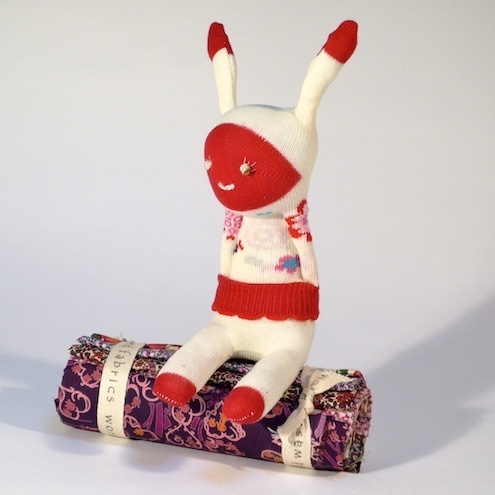 Folksy :: Buy "Little Turquoise Spotty Sock Bunny"
Folksy :: Buy "Bitsy BunnySox"